Thanksgiving seems to have the happy medium. In Canada it’s not a commercial holiday, as it definitely is in the U.S. It’s kind of the quieter sibling of our southern neighbours. In its subtlety I find tranquility. In my family Thanksgiving has always been an escape weekend. We would always go to the cottage to take advantage of the long weekend. Perhaps the scenery plays a role as some of my best memories are of the physical beauty that the province of Ontario offers in the month of October. Leaves of a myriad of colourful varieties, a baby blue sky that matches the lake and the crisp air – not yet cold but no longer warm – definitely leave lasting impressions. When I moved to Costa Rica the thought of having a Thanksgiving never really crossed my mind; forfeiting familiar customs is part of the deal. Au contraire, in this case. Within weeks of arriving I met someone who was only known as “Canadian Matt” – who invited me to Thanksgiving at his place that year and who would turn into one of my best friends – and the rest, as they say, was history. 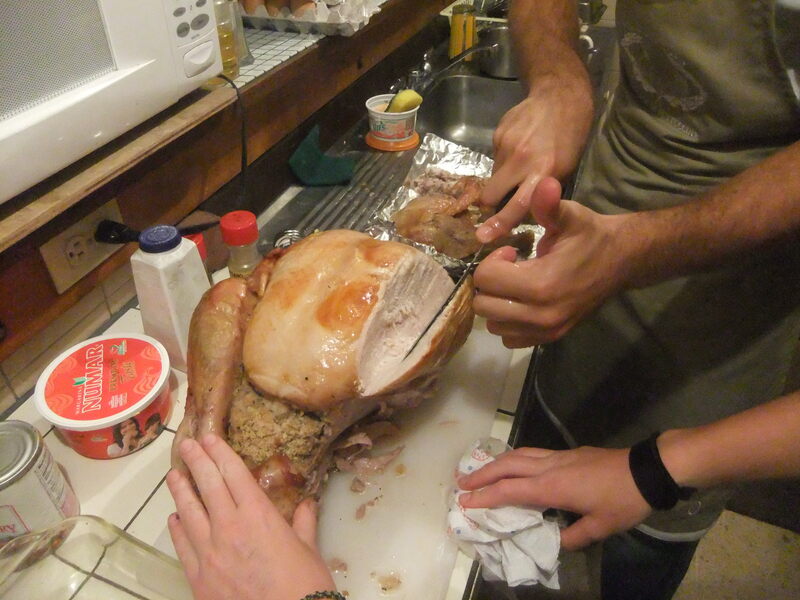 Last weekend marked my fourth, and final, Canadian Thanksgiving in Costa Rica. I’ve hosted two and been a guest at the others. Each one was different yet not less special or meaningful as another. The first was great because it was a big part of acclimating and in feeling welcomed in this country. This year’s meant a lot because it was my last and it was spent with two people – “Canadian Matt” and his now wife Sandy – who have been great friends since my first days here. In that time it has always been called “Canadian Thanksgiving.” Presumably because nobody knew that Canada had Thanksgiving. But with it requiring lots of planning and cooking arrangements, repeating it for “American Thanksgiving” only a few weeks later seemed redundant. And so though deemed “Canadian Thanksgiving” by name, and most guests coming from nations where Thanksgiving is not celebrated, it evolved into an annual tradition independent of the holiday. When you live abroad finding groups of friends to share experiences with is imperative.That’s why, if I had to choose, last year’s would be my favorite. Not because it was better than others but rather because of who was there. With our biggest guest list in my time here – there were between 30 and 40 people – we did it potluck style, but with one important rule: everyone had to bring a dish from their country of origin. It worked out better than ever expected. In addition to the normal fixins’, there was food from: Costa Rica, Nicaragua, the Dominican Republic, Argentina, Peru, Poland, The Netherlands, and Great Britain among others. Even if it weren’t my favorite holiday before arriving it sure would have been as of now. Last year’s gathering embodied what this holiday has represented to me for the four times I’ve had the opportunity to celebrate it: that I’m very thankful to have made the friendships I’ve made in my time here – a lot of which are the best friendships I’ve ever made. When people ask me about “Canadian Thanksgiving” now, my answer is always “it’s just Thanksgiving.” And that’s the way it will always stay. Thanksgiving was always my favorite holiday too. Just getting together with family, eating good food, spending quality time, and passing out on the couch in front of an old movie like King Kong or Mighty Joe Young. Enjoy the holiday!